Friday, June 7 at The Rose Wagner Black Box, the people became powerful. Miguel Gutierrez, a dance improv artist from New York, donned the attire of a “reverse, perverse missionary,” wearing his Church uniform backward (amid his dyed-blond fade and beard) to rile up dancers and nondancers alike. 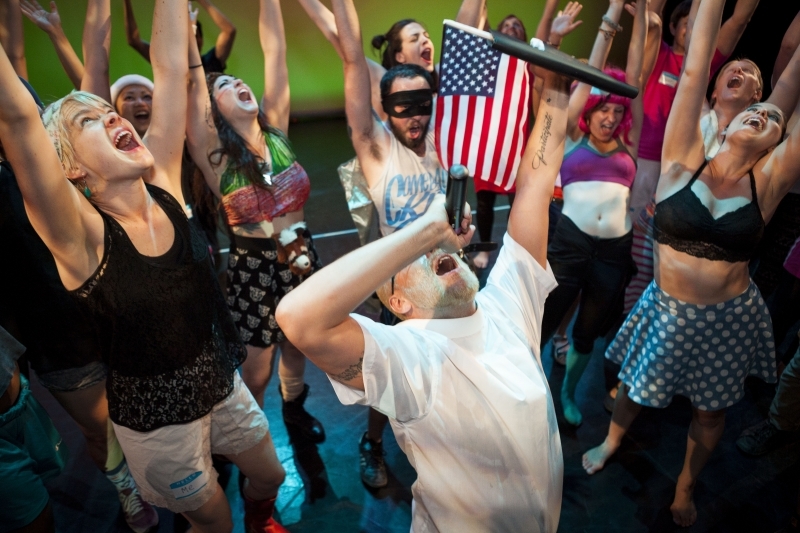 His call to duty, as he introduced himself with a Book of Mormon and an American Flag, was to educate those in attendance about Death Emo Electric Protest: DEEP Aerobics, which was curated by loveDANCEmore and SB Dance, and sponsored by—you guessed it—SLUG Magazine. Essentially, DEEP Aerobics is an unpretentious dance-meets-aerobics class in which Gutierrez leads participants in unadulterated movement to create performance. People dress up in funky, comfortable getups to enhance the joviality of the event, which also lessens the sense of awkwardness one may feel from dancing and moving their body with strangers—I wore a super-hero outfit, with a black tube-sock mask, my Comeback Kid tank, black Adidas, running shorts and a throwback SLUG Pride 2012 Superqueeroes cape. Immanent to each DEEP Aerobics is the Transformation Station where costume-less dancers can suit up—Friday’s was supplied by loveDANCEmore Director Ashley Anderson. Personally, I think that it is the utmost engaging way to involve those not versed in dance in the art form that I’ve witnessed in Salt Lake City. Though Gutierrez lives in New York, luckily, all those who attended were awarded a certificate to teach DEEP Aerobics, as long as they credit him as the progenitor of the practice. It’s difficult to reiterate all that transpired at DEEP chronologically, as the experience was fraught with Gutierrez directing we, the Powerful People, with motion around the room and repeating chants with devoted enthusiasm. We began by (unofficially) warming up with dance circles as Hey, Gabba Gabba, blown out beyond immediate recognition, played on a huge screen, then officially by having our own, respective runs around the room. Gutierrez led us en masse to inanimate objects, like when we shouted, “Hey, light!” at the lights near the entrance. ESSENTIAL to the DEEP Aerobics experience is the bounce, about which Gutierrez enlightened us as we hopped about ecstatically. In this routine, Gutierrez personifies words and body parts: He implored us to think about something that oppresses us, to which we repeated “No!” as we pushed our arms out away from us along with the four-on-the-floor dance beat from the tracks that played in the speakers. Gutierrez consecutively said, “But we can’t live in the ‘No!’” and so we rose our hands in the air along with the beat to proclaim “Yes!” “Maybe” followed with shoulders shrugged and horizontal hands up by our ears. We cooled down when we became French amoebas who swayed with the motions of the energy in the room, slowly. It was easy to tell who some of the people were who have a background in dance, as many of those people began some light contact improv. In the end, we formed a circle around the room and pointed in the same direction, to the left and to the right (the girl next to me probably thought I was silly because I thought that Gutierrez, who was across from me, meant HIS left). Gutierrez ended the spectacle by laying down certificates around the room for us to pick up. Be sure to catch Gutierrez perform this Thursday at the Marriot Center for Dance at the University of Utah. To learn more about dance and about what types of dance events are going on in Salt Lake and Utah, visit loveDANCEmore.org and SBDance.com.